1. Alexander F. G. Wintges. "Tumor immunosurveiliance: Innate immune activation as a mechanistic prerequisite for efficient immune checkpoint blockade in cancer immunotherapy." d-nb.info. 2018. 4. Gavin C. Sampey, David M. Irlbeck, et al. 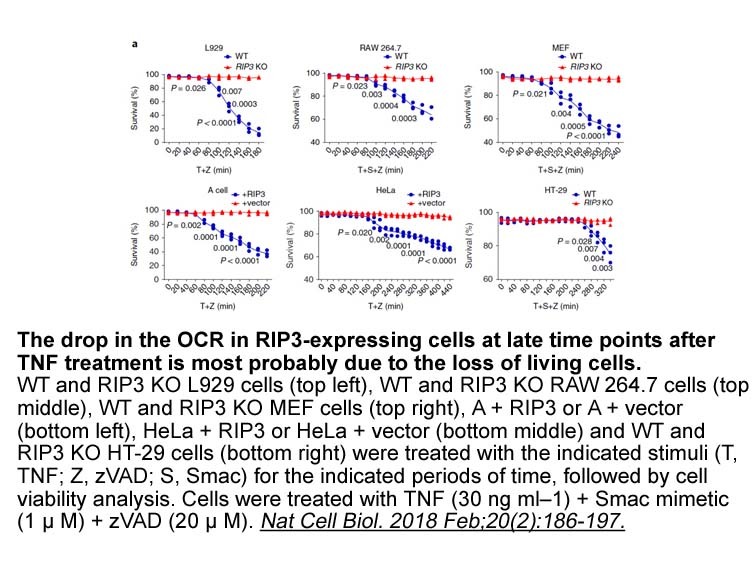 "The SMAC Mimetic AZD5582 is a Potent HIV Latency Reversing Agent" bioRxiv.2018.May 2. To determine the binding affinities of SM-164 to XIAP containing both BIR2 andBIR3 domains, an FP-based competitive binding assay was established using a bivalent fluorescently tagged tracer, named Smac-1F. The Kd value of the bivalent tagged tracer to XIAP containing BIR2 and BIR3 domains was determined to be 2.3 nM. In competitive binding experiments, a tested compound was incubated with 3 nM of XIAP protein containing both BIR2 and BIR3 domain (residues 120-356) and 1 nM of in the same assay buffer. Limited solubility. General tips for obtaining a higher concentration: Please warm the tube at 37 ℃ for 10 minutes and/or shake it in the ultrasonic bath for a while. Stock solution can be stored below -20℃ for several months. 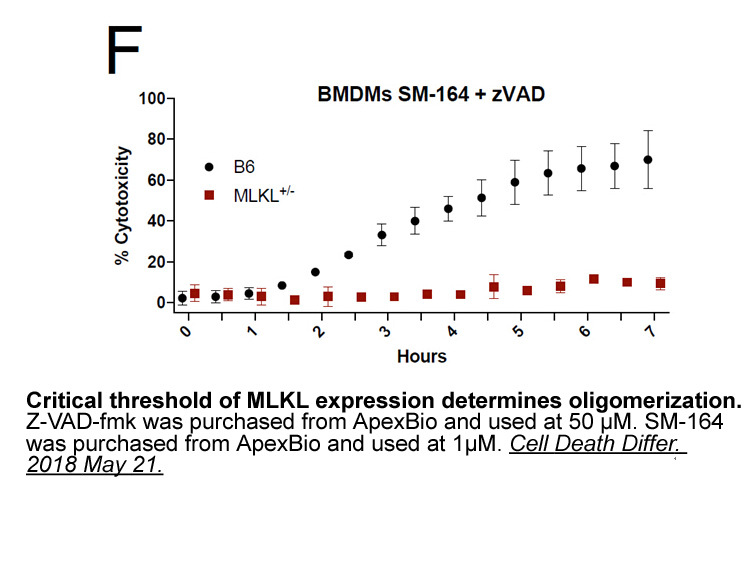 12 h 1 nmol/L SM-164 treatment induces 32%, 33%, and 37% of the MDA-MB-231, SK-OV-3 and MALME-3M cells to undergo apoptosis. SM-164 also leads to cIAP-1 degradation in resistant cancer cell line and effectively antagonizes cellular XIAP. 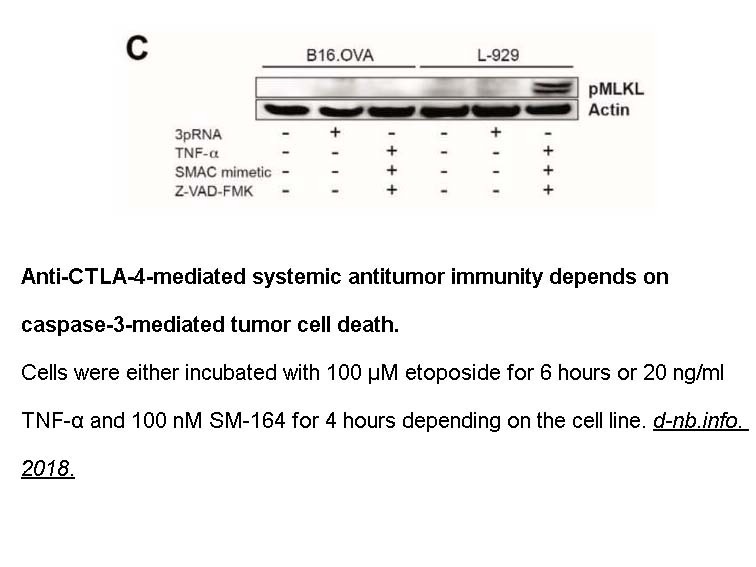 Moreover, 3 to 10 nmol/L SM-164 induces cell death with or without TNFα in all these sensitive cancer cell lines. A single i.v. dose of SM-164 at 5 mg/kg. 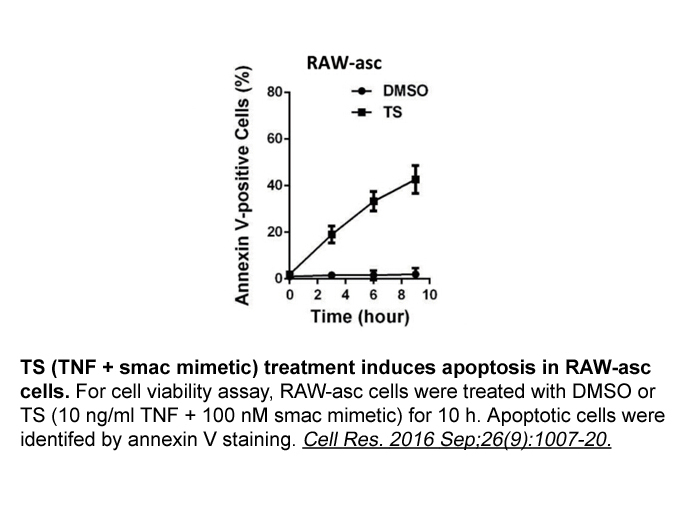 At the 3-hour time point, SM-164 induces prominent apoptosis in tumor tissues, and more than 50% of tumor cells were TUNEL positive at the 6-hour time point. SM-164 reduces the tumor volume from 147 ± 54 mm3 (day 25-start of the treatment) to 54 ± 32 mm3 (day 36-end of treatment), a 65% reduction. SM-164 treatment also shows no significant weight loss or sign of toxicity. 1. Lu J, Bai L, Sun H, Nikolovska-Coleska Z et al.SM-164: a novel, bivalent Smac mimetic that induces apoptosis and tumor regression by concurrent removal of the blockade of cIAP-1/2 and XIAP. Cancer Res. 2008 Nov 15;68(22):9384-93. SM-164 is a bivalent mimetic of Smac with Ki values of 0.31 nM, 1.1 nM and 0.56 nM for cIAP-1, cIAP-2 and XIAP, respectively 1. 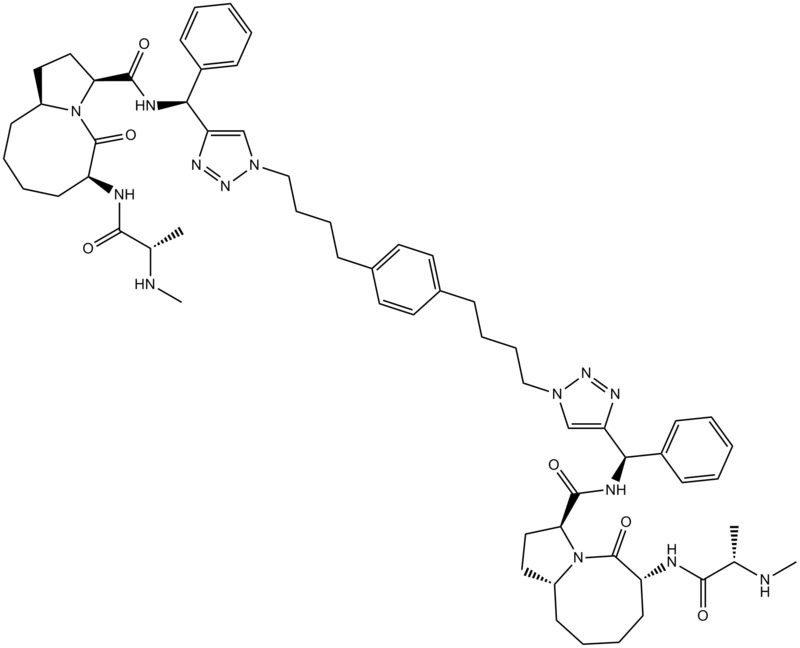 SM-164 is developed as an anticancer agent. It plays its antitumor roles through inducing degradation of cellular inhibitor of apoptosis protein (cIAP)-1/2, antagonizing X-linked inhibitor of apoptosis protein (XIAP) and inducing TNFα–dependent apoptosis in tumor cells. SM-164 is a bivalent mimetic containing two SM-122 analogues. It binds to cIAP-1 protein containing bothBIR2 and BIR3 domains, cIAP-2 BIR3 protein and XIAP protein containing both BIR2 and BIR3 domains with Ki values of 0.31 nM, 1.1 nM and 0.56 nM, respectively. 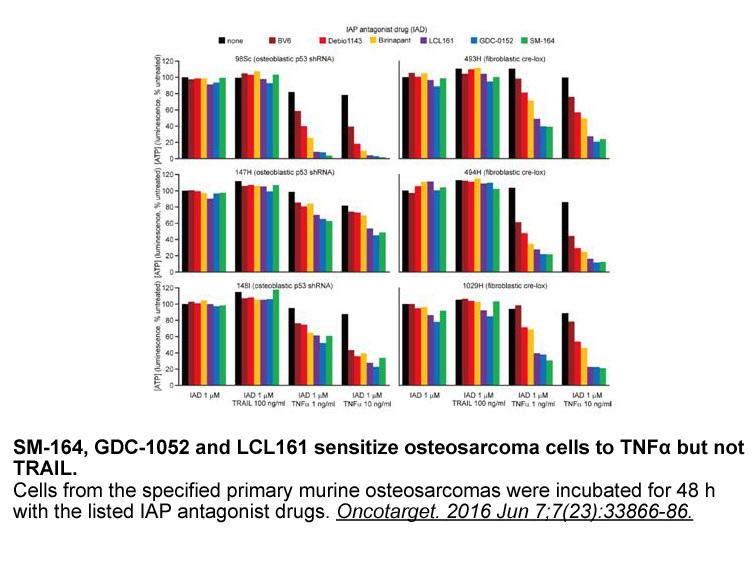 In tumor cells, treatment of SM-164 significantly reduced cIAP-1 level to undetectable levels (1nM, 60min), effectively antagonized cellular XIAP and enhanced TNFα secretion. In the MDA-MB-231 xenograft model, administration of SM-164 at dose of 5mg/kg markedly decreased cIAP-1 level within 1 hour and activated caspase-8, caspase-9 and caspase-3 at 3 hour 1. 1. Lu J, Bai L, Sun H, et al. 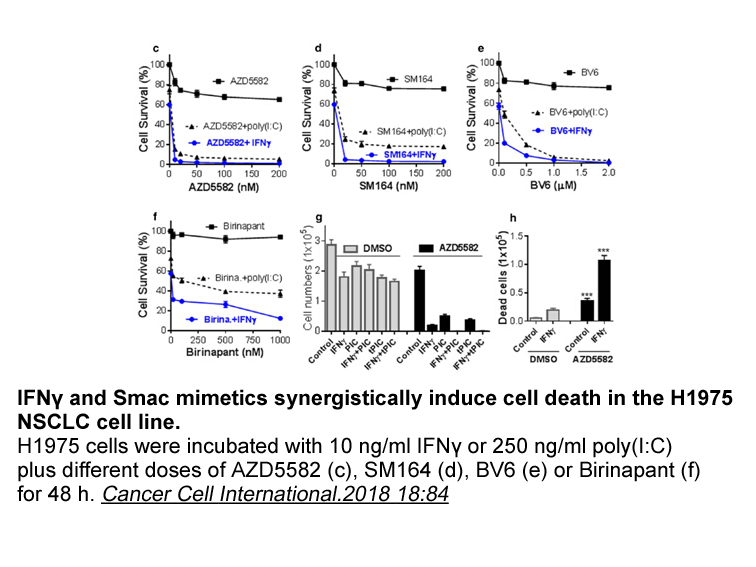 SM-164: a novel, bivalent Smac mimetic that induces apoptosis and tumor regression by concurrent removal of the blockade of cIAP-1/2 and XIAP. Cancer research, 2008, 68(22): 9384-9393.